What is Otrivine (Xylometazoline Hydrochloride) used for? 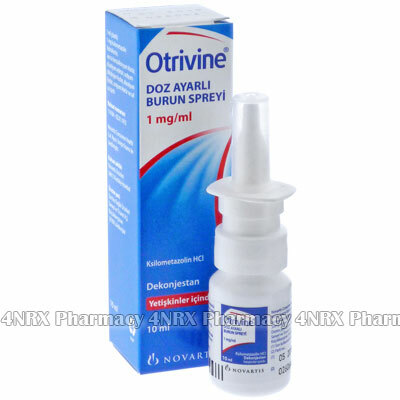 Otrivine (Xylometazoline HCL) is a nasal spray used to treat nasal congestion. The medication operates by constricting blood vessels in the lining of the nose to reduce swelling and blockage. It is commonly used to treat congestion caused by seasonal allergies, cold, or flu. Your doctor may also recommend its use for the treatment of other unlisted conditions. How should I use Otrivine (Xylometazoline Hydrochloride)? Otrivine (Xylometazoline HCL) should always be used according to your doctor`s instructions and those included with the packaging to get the best results from treatment. Most patients are prescribed one or two sprays to be administered twice each day eight hours apart. To use the medicine gently blow your nose, shake the bottle gently to mix its contents, remove the cap, insert the applicator into one nostril, and gently inhale while operating the pump to administer the dose. If more than one spray is prescribed it is suggested to alternate nostrils to prevent irritation. Do not spray the medication into your eyes or mouth. Wipe the applicator with a tissue or cloth after each administration to prevent contamination and replace the cap. What are the side effects of Otrivine (Xylometazoline Hydrochloride)? Stop using the medication and contact your doctor as soon as possible if you experience any intense or worrying symptoms including an irregular heartbeat, hallucinations, seizures, or signs of an allergic reaction such as hives, skin rashes, swelling, or difficulty breathing. These conditions may require lower doses, reduced application frequency, or immediate medical attention in serious cases to prevent further complications from occurring. Otrivine (Xylometazoline HCL) is only meant for nasal use and should not be administered orally. This medication should not be used by patients under the age of twelve, who have had the pituitary gland surgically removed, who have recently had neurosurgery, or who have taken an MAOI medication within the last two weeks. Also disclose if you have hypertension, hyperthyroidism, diabetes, heart disease, or narrow angle glaucoma as these conditions may lead to unexpected health problems requiring alterations to your treatment. Strictly use Otrivine (Xylometazoline HCL) as prescribed and follow all instructions provided by your doctor. Safe, suitable, and optimum dosage can vary and is dependent on the patient`s health and medical history, as well as the condition you are treating. Otrivine (Xylometazoline HCL) may not be safe or suitable for all patients. Always ensure your doctor is informed if you are pregnant or breastfeeding, using any other type of medication (including non-prescription medicine, vitamins, and supplements), as well as if you have any allergies, other illnesses, or pre-existing medication conditions.